When it comes to choosing the best toothpaste for your kids, all of the options available can be quite overwhelming. Should you aim for tartar control? How important is fluoride? Do you kids complain of tooth sensitivity? And then there are the formulas with different flavors and sparkles that make brushing teeth fun. Smile Reef would like to offer the following basics to help you decide on the best toothpaste for your child. Abrasive agents. Scratchy materials like calcium carbonate and silicates help remove food, bacteria and even some stains from teeth. Humectants. These are added for moisture retention. Paste and gel toothpastes often contain substances like glycerol to prevent the toothpaste from drying out. Detergents. Think about all of those suds you see when you brush your teeth. They are caused by detergents like sodium lauryl sulfate. Flavoring. Artificial sweeteners like saccharin are often added to toothpaste to improve the taste. While many adults associate the flavor of toothpaste with mint, toothpaste is also available in a variety of flavors including cinnamon, lemon-lime, and even kid friendly bubblegum. Thickening Agents. These add thickness to the toothpaste to help achieve and maintain the proper toothpaste texture. The most important ingredient to look for when choosing a toothpaste is fluoride. Fluoride is a naturally occurring mineral which has been instrumental in the dramatic drop of cavities and tooth decay over the last 50 years! Bacteria in your mouth routinely feed on the sugars and starches that remain on your teeth after eating. Fluoride helps protect your teeth from the acid that is released when this occurs by making your tooth enamel stronger. In addition, it can actually reverse the early stages of acid damage by re-mineralizing areas of the teeth that have already started to decay! Using fluoride toothpaste is an important way to ensure that teeth are reaping the benefits of this mineral. Many people think they do not need to worry about fluoride if they like in an area like Las Vegas where fluoride is already added to our water, but studies have shown you can still benefit from using fluoride toothpastes. 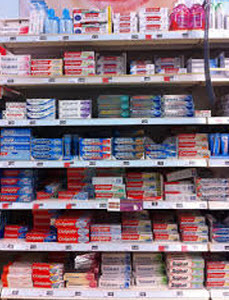 There are many tartar control toothpastes on the market, most of which also contain fluoride. We all have a layer of bacteria on our teeth called plaque. If this plaque is not removed, it quickly hardens into tartar. Tartar is a difficult to remove deposit that can build up on your teeth and under your gums which can ultimately lead to gum disease. There are a variety of ingredients used in toothpaste to help prevent the buildup of tartar on teeth. Chemical compounds are often added and sometimes even antibiotics which kill off some of the bacteria in the mouth. Certain toothpastes that contain multiple anti-plaque agents have been found to be even more effective at tartar control than varieties with only one plaque fighter. For children who have teeth that are easily irritated, particularly by hot or cold temperatures, there are many toothpastes available that are targeted towards sensitive teeth. These toothpastes usually contain chemical compounds to help tooth sensitivity by blocking pathways through the teeth that attach to the nerves inside. Please be aware that when trying a new toothpaste, it can take up to four weeks for the sensitivity to improve. With so many options available, you can try different brands, types and flavors to find the best toothpaste for you and your children. And always feel free to call upon Smile Reef for advice! We know that parents and caregivers want the best for their children and good oral health care is key to overall health and well-being! Smile Reef wants to partner with you and be the home base for your child’s oral health needs. We want to be your dental home! But what is a dental home? A dental home is an ongoing relationship between the dentist and the patient. It includes all aspects of oral health care, given by the dental home in an accessible, comprehensive and family centered way. A dental home is a familiar and comfortable place for both children and parents to access information on oral healthcare and guidance. It is also a place to help children learn good dental care tips and habits and where parents can receive personalized guidance and advice on what they can do at home between visits to encourage children to have optimal oral health. The establishment of a dental home is a cost-effective and higher quality health care alternative to emergency care situations because children that have a dental home are more likely to receive appropriate preventive and routine oral health care! Even though it is recommended to establish your dental home by age one, fortunately it is never too late! • Cavity Prevention – Nearly 60% of children have tooth decay by age five but nearly 100% of this tooth decay is preventable. As your dental home, Smile Reef will ensure that you have the knowledge and tools you need to help your kids maintain healthy teeth and prevent these unnecessary cavities. • Emergency Assistance – No matter whether your child chips a tooth or knocks one out entirely, Smile Reef are here for you in emergency dental situations. We know your child’s dental history and your child knows us. They will feel more comfortable coming to us for emergency dental care than some place they are not familiar with. • Specialized Training – Dr. Jaren Jensen has the highest level of training a pediatric dentist can achieve. After graduating from Brigham Young University with a Bachelor of Science, Dr. Jensen graduated at the top of his class at Creighton University School of Dentistry. After earning his D.D.S, Dr. Jensen specialized in Pediatric Dentistry at the University of Southern California and completed his residency at the Children’s Hospital of Los Angeles. All of this specialized training and experience includes child psychology and behavioral concerns, growth and development, and diverse special health care needs. • Welcoming Environment. Our Smile Reef office is totally kid friendly and family oriented because making kids feel relaxed and comfortable is a top priority for us. 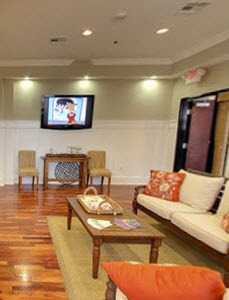 Our office was purposely designed to be calming and inviting for children. What kid would not look forward to visiting an office with our interactive play area; ipads at their disposal, lots of toys and games and a big screen movie area. We also have a cool salt water fish tank and surfboard with waves! Our kid-friendly environment includes sinks that are at eye-level for young children and we have special dental chairs for children that are smaller in scale so that when children climb up, they don’t feel overwhelmed or intimidated. The furniture matches the child. We also talk to children in child-friendly vocabulary. We make word substitutions and we vary the tone of our voices so that we can remove anything that sounds as if it would be scary or uncomfortable. And we always involve the parent. We will often have the parent put the child in their lap or have the parent sit right next to them to make them feel comfortable and safe. By choosing Smile Reef as your dental home, you will have a trusted partner to help keep your child’s teeth healthy, now and in the future.